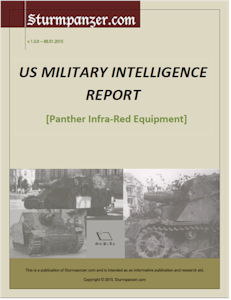 Intel Report on German Infra-Red Equipment as fitted on the Panther Tank, with 2 drawing of the equipment. "Four Panther Model G tanks equipped with Infra-red were at FALLINGBOSTEL with the "Panzer Jaeger Lehr and Versuchskompanie". They were, however, not withdrawn northwards with the soft skinned vehicles on the formation of "Kampfgruppe Uhu" but were committed, in a daylight role, into the battle north east of MINDEN. The following report is based on examination of these tanks, three of which were burnt out and the fourth badly smashed, and on the interrogation of one of the crew who subsequently rejoined "Kampfgruppe Uhu"."